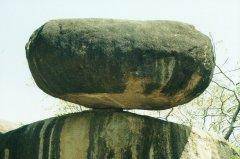 Balancing rock of Jabalpur is indeed a marvelous creation of nature. A large, independent rock precariously balanced over another rock appears like a magical trick. This rock is located close to the Madan Mahal fort and is definitely worth spending a little time. Enjoy the scenic beauty of the nearby hillocks and take opportunity to examine this interesting rock a little more closely.